The Australian reports that China's small factories struggle. THE global downturn is taking a severe toll on China's dynamic small businesses, forcing them to adopt innovative, and sometimes desperate, strategies to survive. Ye Jianqing, like many other Chinese entrepreneurs, has seen a sharp decline in orders from the US and Europe, which account for most of his business. Last year, sales of the sunglasses his company, Wenzhou Zhenqing Glasses, makes dropped 80 per cent to less than $300,000 ($AUD 470,000) from $1.5 million in 2007. Fearing his eight-year-old business might not survive another year, Mr Ye is switching gradually into new products, such as key rings and prescription eyewear. "If you're not innovative and you don't change yourself, you're just waiting to die," he says. The fate of small businesses like Mr Ye's will help determine how the world's third-largest economy rides out the current downturn, China's worst since the Asian financial crisis a decade ago. According to rough official estimates, the private sector, which is primarily small businesses, accounts for close to 60 per cent of China's economic output, and employs three-quarters of the urban work force. That's a big turnaround from just a decade ago, when stodgy and poorly run state enterprises dominated the economy. Entrepreneurial activity hasn't ground to a halt. In Guangdong province, a manufacturing and trade hub, 62,400 companies shut down in 2008, according to government records. But 100,600 companies were started, resulting in a net increase of 38,200 companies. Arthur Kroeber, managing director of Dragonomics Research & Advisory in Beijing says there are many benefits to the rise of small business, "The Chinese economy is a lot more flexible today than in the 1990s. "Private firms can shift from unprofitable to profitable lines of business, and adjust their wage and other costs, much more quickly,' he said. But many small companies survive on the business of just a few clients, or sell very low-margin products; they could be forced to close if a big client suddenly delays orders, or when they don't plan ahead for currency fluctuations. Bigger businesses are more cushioned from such effects. As global demand for almost everything weakens, small companies' legendary flexibility is no guarantee they'll survive. Many companies have already closed, putting millions of people in China out of jobs. Small-business owners who are still in business are willing to try almost anything. Sometimes there are manufacturing synergies to such changes, but other companies take a gamble on products they have no experience with, or which have no proven market. Chongqing Linsheng Industry & Trade, which has made motorcycle parts for 13 years, is considering launching a line of mechanical self-shuffling mah-jongg tables. In Wenzhou, shoe-factory employees are now churning out light-emitting diodes, and in Shenzhen, a maker of plastic signs shut down briefly and then reopened as a maker of decorative holiday decals. Eric Wu, general manager of manufacturer and exporter Duolilong Industrial said "In Chinese we have a saying that 'it's easier for small boats to turn around,'" says Eric. Until recently a booming manufacturing hub in China's south. The 11-year-old company has already completely switched products once before. Earlier this decade, as the market for fans shrank, it changed to making battery chargers. Now, executives are about to do it again, with plans to release a new line of energy-saving power tools this year. "If we don't change, then we have no hope," Mr Wu says. The economic importance of China's small businesses is getting some recognition from the government. Officials have instructed banks since the fall to lend more to smaller companies. But it isn't yet clear how much of the rebound in bank lending in the final months of 2008 - it rose 18.8 per cent year-to-year in December - went to small business. Many analysts suspect the big state firms that banks have long favored were still the main beneficiaries. Small businesses' attempts to survive can come at the expense of workers, who have little bargaining power with bosses. Though new labour legislation that came into force last year was intended to strengthen worker protections, it remains easy for private companies to hire and fire in China. Chinese officials have been trying to prevent such layoffs recently, but some factory owners are simply walking away as things get bad, leaving workers without pay. In one case, the owner of a clothing company in Shenzhen disappeared, leaving 212 workers with 1.14 million yuan ($AUD264,000) in unpaid wages, according to state-run media. In October, the manager of Hong Kong-listed toy company Smart Union Group Holdings, whose clients included Mattel , fled after Smart Union filed for bankruptcy, leaving 7,000 workers at the company's two factories in Dongguan without jobs and owed back pay totalling more than 24 million Yuan. The flexibility to fire workers could well be accelerating China's downturn now -- but it may mean managers can move equally quickly to ramp up again in a recovery. "In a very cold-blooded economists' way of talking, it means the labor market has maximum flexibility," says Qu Hongbin, an economist with HSBC in Hong Kong. "When it comes to surviving the downturn, those things are a plus, though they are negative from a moral perspective." Executives make no apologies about doing what they think is necessary to get through the downturn. Constant reinvention has always been a way of life for some Chinese companies. "It's a game of waiting to die, or doing what you need to do to try and survive," says Huang Huigu, chief executive of computer-bag and -accessory maker Guangzhou Kingsons Leather Products, which is releasing lower-price versions of its most popular products. Mr Huang is reading a Chinese business book released in October called "Rebirth through Switching. China Daily reports that financial crisis drives away 600,000 migrants from Guangdong. BEIJING - An estimated 600,000 migrant workers have left China's southern Guangdong Province due to unemployment in 2008 after the worldwide financial crisis hit the region, a government official said Thursday. Guangdong Province Vice Governor Huang Yunlong revealed the statistics at a press conference after the country's top economic planner released a long-term plan to develop the Pearl River Delta. Guangdong is the forefront of the country's reform and opening policy. Since 1978, the province's annual gross domestic product (GDP) has increased by an average of 13.45 percent, 3.5 percentage points higher than the nation's average. The Pearl River Delta in southern Guangdong is the country's manufacturing and exporting center. However, the financial crisis has brought Guangdong "the most difficult year after the 1998 Asian financial crisis", Huang said. "More than 143,000 migrant workers left Guangdong in the first half of 2008. By the end of last October, the number reached 500,000. The Guangdong statistics bureau estimated that a total of 600,000 migrant workers might have left the province last year," he said. 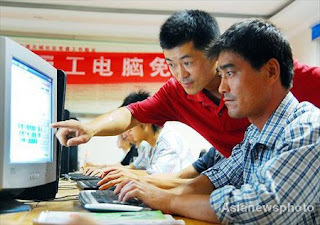 China Daily reports that China advances vocational training to help laid-off workers. About 4 million laid-off worker in China attended vocational training for reemployment in 2008, the Ministry of Human Resources and Social Security said Monday. Another 400,000 received education to start self-employed business, which encouraged individuals to be their own bosses and make a living, the ministry's spokesman Yin Chengji said. "We have set up special funds and are using social unemployment benefits to strengthen training for workers. We also emphasize vocational training for the laid-offs, especially the migrant workers," Yin said. He said the training would cushion the impact of the global financial crisis and was aimed at stabilizing the employment situation in the country. East China's Shandong province had organized training programs for 230,000 laid-offs last year, and 75 percent of those trained found new jobs, according to local government figures. The Ministry of Finance also said in mid-January it would play a leading role in creating jobs in government-initiated projects such as civil infrastructure building and environmental protection. China Daily reports that Chinese graduates are being offered cash incentive to 'Go West'. College graduates who take jobs in central or western China will be entitled to a full refund of their tuition fees, the State Council said yesterday. The refunds will be paid to all graduates who find employment in towns and villages in central and western China, or in other remote areas of the country. Those who join the army will also be entitled to the payments. The offer was announced following an executive meeting of the Cabinet chaired by Premier Wen Jiabao held to help graduates find jobs. The meeting was the second in a month to discuss employment. The first, on Dec 10, was held to address issues affecting migrant workers. "China's employment outlook is grim due to the global financial crisis," a statement issued after the meeting said. Chen Guangjin, an expert on employment issues with the Chinese Academy of Social Sciences (CASS), said: "This is the first time the government has offered to refund tuition fees, and it shows its determination to stabilize the job market." An earlier report by the CASS said the unemployment rate among new graduates was over 12 percent at the end of last year, leaving 1.5 million without work. Some 6.1 million new graduates will enter the jobs market this year. Chen said China's western and central regions offer many good opportunities for graduates. But many "would still rather do low-skilled jobs in affluent Southeast China", he said. According to a recent report in Gaungzhou Daily, over the past six months, more than 2,000 graduates have applied for jobs as domestic helpers in Guangzhou, capital of Guangdong province. "We get about 500 to 600 applications a month, and more than 90 percent of them are from university students, including master's students," the newspaper quoted an employee of a housekeeping recruitment agency as saying. Encouragement for graduates to seek jobs with SMEs and private companies. Preferential tax and loan policies for graduates who set up their own businesses. China View reports that more than one million migrant workers find new jobs after returning home in SW China. CHENGDU, Jan. 27 (Xinhua) -- More than one million migrant workers, who were forced to return home late last year amid the impact of the global financial crisis, have found new jobs in southwest China's Sichuan Province. 1) China' s export sector is shrinking and this means millions of migrant workers are losing their jobs. However, the prospects for unemployed migrant workers are far better than they are for America laid off workers. Unlike the US, China' s service sector is still growing. This means that laid off workers are finding new jobs or starting their own companies. 2) China' s shrinking export sector represent supply destruction. Chinese exporters, in the face of decreasing foreign demand, aren' t lowering prices, they are shutting down their businesses. 3) I also believe the all these migrant workers and college graduates returning home will help boost consumption in inner China. These young workers/graduates will push their relatives to buy computers, cell phones, and other modern gadgets they have gotten used to using. 4) China' s focus on the consumption and standard of living of inner China is bad news for the US. When inflation goes out of control, Chinese officials will be faced with dropping its successful effort to promote domestic consumption or dropping its dollar peg (which has been unsuccessful at helping exporters). Conclusion: The standard of living for rural China will be going up, and the standard of living for Americans will be going down. The past two weeks I've noticed a striking lack of stock at Cost Plus World Market. This week, many shelves were empty. I spoke with an employee, asking her what was going on. She indicated that corporate decided to reduce shipments. She also said the computer shows that items are expected to be re-stocked, but it offers no date. Luxury imports are one of the first things to go. Looking at the bare numbers (http://www.jjahnke.net/index_files/08160.gif) you can see the exports crashing, at least in relation to the former ever expanding numbers. What is more important is that I hope that China can meet its need to feed its people. Currently - the first time ever - BASF partly stops it's ammonia production (http://www.spiegel.de/international/business/0,1518,600010,00.html) and you read farmers have no money to buy fertilizer. My father is farmer and he told me thats right - ships with fluid fertilizer came back to the EU because the customers in Asia could not pay for the stuff so that he got a recent bargain on fertilizer. Also big farmland areas in Russia are lying bare, because there is no money to cultivate the fields in fear of the price developments that have - due to speculation - decoupled from the real needs for food 6 months on in the future.